TAX is nothing but a compulsory contribution to state revenue, levied by the government added to the cost of some goods, services, and transactions. TAX in Connect will be maintained for the POS Operations. TAX can be defined by the combinations as (Location, Department, Product Category, Product). Take Away Department will have the different taxes than the Restaurant Department. Location A has the different tax percentage in Location B. STEP 1: Go to CONNECT --> MASTER --> TAX. The Page displays all the Taxes. NOTE: From this Page, you will be able to export the Tax or Edit or Create the Tax. STEP 2: To Create a New Tax. Just click CREATE DINEPLANTAX and enter the Name under Tax Tab. Transaction Type What account in which the TAX should be carried. In the chosen Transaction Type, you will be able to see the Value of the Transaction. 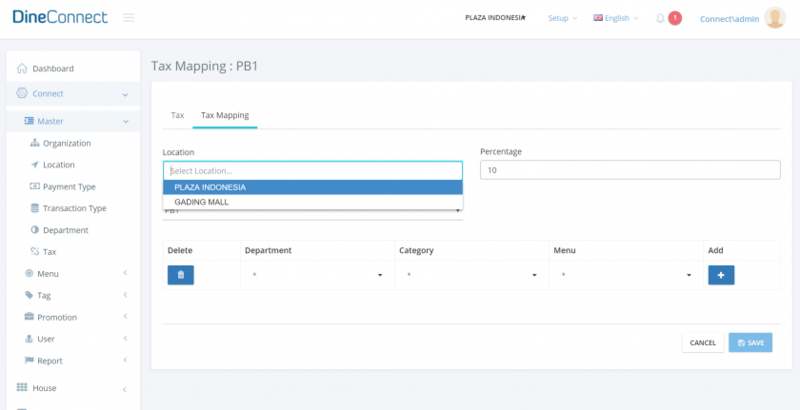 STEP 5: From this Page, you would be able to Edit the TAXES for Previous Locations or Click Clone Mapping to Add New Location.